Shop at 100% Pure via Shopcred and you can save money with our 100% Pure deals, coupon codes and offers. Plus earn rewards on eligible purchases which are redeemable as cash and join our conversations. Shopcred is the modern place to Shop. 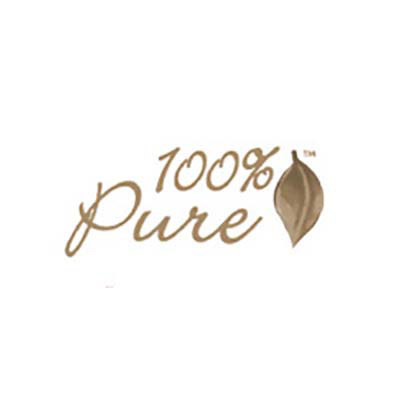 Our community have not posted any deals for 100% Pure just yet; why not be the first and share a deal! Kate Hudson is one of the celebrities using 100% Pure Organic Coffee Bean Eye Cream. This eye cream was named a "Top Anti-Aging innovation" by Dr Oz. and has reached cult status in the US with sales to date topping 2 million pieces. Susie Wang made the decision to create a line based on 100% natural food-based ingredients so women have an option to use products on their skin that are as safe and nourishing as the fruit and vegetables they eat. Manufactured in their own plant in California USA, 100% Pure formulates truly 100% Pure, vegan (or vegetarian when cruelty-free honey is in formula), synthetic fragrance free, paraben free, toxic free and the most concentrated formulas possible without the use of water, thickeners, emulsifiers or any other cheap fillers. Cruelty-free 100% Pure products are never tested on animals. The company now employs more than 75 staff and currently has 17 Beautiful (environmentally designed) concept stores including San Francisco airport, Santana Jose & Hollywood.